Earlier today I walked a few blocks from my office to Ottawa’s Rideau Centre to attend a press conference with Industry Minister Tony Clement and Canadian Heritage Minister James Moore, who promised an important announcement. 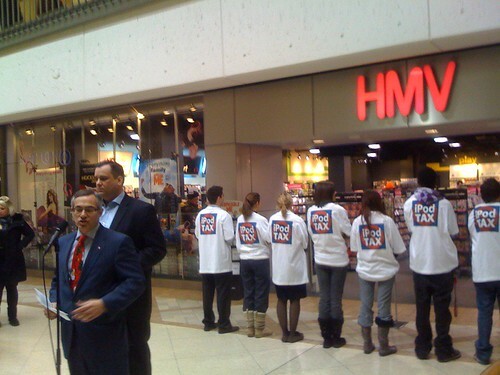 The two ministers stood in front of an HMV and a group of students wearing t-shirts with No iPod tax logos on the back to declare that they were firmly set against a massive new tax on technology for all the holiday shoppers in the mall. The Ministers claimed that all three opposition parties supported a tax of up to $75, which (reminiscent of the Dion “tax on everything” campaign) would apply to all technology devices and even cars.